I hate when beach goers dump their garbage around the beach because then animals will mistaken it for either food or a toy and it could kill them. Yet, every time I walk on the beach and find garbage, I pick it up and throw it in the nearest garbage bin I can find around there. I actually filmed this myself picking up all the marine debris in all hopes it would bring awareness to the effects that marine pollution can have on animals like death by ingestion or entanglement and if you think that I’m just exaggerating, then you may want to check out the statistics. The Statistics speak for itself. However, it is never too late to save marine life from the hazards entanglement brings to them. Here are a few things you can do to prevent marine pollution. 1. Never leave trash behind at the beach. 2. 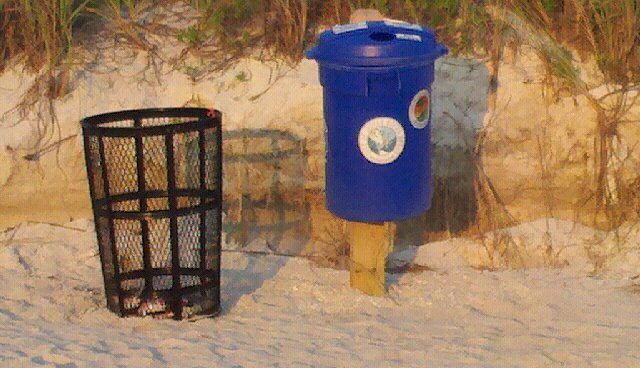 If you spot some trash on the beach, be sure you pick it up and trow it away in a nearby garbage can. In addition, you can always use an unused plastic bag in your possession to do some additional cleaning. 3. Take part in annual beach clean ups. 4. Reduce, reuse, and recycle. 5. If you see a sick or injured animal, please call wildlife authorities right away. This trash can is where garbage belongs. You can find these garbage cans at your local beach so it can be easier for you to reduce littering that normally occurs there. Every year from April through October, hundreds of thousands of sea turtles nest on beaches across the southeastern United States from South Carolina to Texas. (Photo by the Fish and Wildlife Service). The summer season can mean a lot to many people. For school children of all ages, it means summer vacation and a week or two at camp while for some college students, it means either having a summer job or hacing an internship, and for the adults, summer means backyard cleaning and back-to-school shopping for the kids. For sea turtles, however, the summer season means that it’s nesting season because from April through October, thousands of female sea turtles will come to shore on the beaches of the Southeastern United States to lay their eggs with the peak season being in late June and early July for loggerheads. During the night, females will leave the water and crawl up the beach where they will start digging an egg chamber cavity for their eggs before the egg-laying process begins. On average, female sea turtles will lay up to 100 golfball-sized eggs . Once the ggs are laid, the females will then gentely cover the nest with sand before returning to ocean since they do not raise their hatchlings. The hatchlings will develop in the eggs for the next 44-55 days while the sand temperature will determine their gender. If the sand temperature is too warm, then, the hatchlings will be all females while the cooler sand temperature will make all the hatchlings males. Once the eggs are fully incubated, they will hatch and the hatchlings will emerge from the nest in mass numbers as they make their way into the ocean. However, only 1 in 4,000 sea turtle hatchlings will survive into adulthood and if they do, female hatchlings will return to the same beach where they were born 12-20 years later while their brothers will remain at sea for the reat of their lives. While watching a sea turtle lay her eggs on a beach is an amazing site to see, it’s very important that such observation has to be done in a very responsible manner. This is because many times when beach goers try to observe a nesting sea turtle, it often results in the female making a false crawl, due to the use of lights that the beach goers use to help them find their way around at night, and you should never ever have a light on you when observing nesting females on a beach. Still, here are some ways you can observe nesting sea turtles without disturbing them. Turn off the lights because both adults and hatchlings rely on the light and reflections of the moon to find their way to the beach and back out to sea. Artifical lights can put sea turtles in dangerous sitiuations, many of which can lead to death. Limit noise by using only soft voices so it would not be disturbing for the nesting turtles. Be sure you give sea turtles the proper amount of space before and after they lay their eggs. When a turtle does begin the egg-laying process, she may be apporached or viewed more easily. Do not take flash photographs, only take flash-free photos from behind the turtle as she lays her eggs. Please do not litter on the beaches because both adults and hatchlings can get either trapped or entangled in the rubbish. I hope these turtle viewing tips will help observe sea turtles during the nesting season and I hope you get the chance to see a nesting turtle. On April 20th, 2010, The Deepwater Horizon oil rig exploded in the Gulf of Mexico. It killed about 11 oil workers and caused the entire rig to sink into the Gulf about two days later. As a result, more than 206 million gallons of oil spilled into the gulf waters which would go on to affect more than 9,436 marine animals (NOAA, 2011). The animal victims were birds, cetaceans, and sea turtles and many of these animals are either endangered, or threatened. However, while most of the animals that were recovered from the oil spill were rescued and rehabilitated, others sadly, were not so lucky. In fact, the large majority of these oil spill victims have either died or have never been found. While studies are currently being done by wildlife officials to learn about the effects the Gulf oil spill is having on wildlife, it may be more than 20 years before we would learn about the full effects on wild marine animals and their habitats. This recent oil spill in the gulf coast has been taking it’s toll on wildlife, including dolphins, turtles, and birds, on a long-term scale. During the oil spill, which lasted for six months, about 100 cetaceans were collected from oil spill inflicted areas (NWF, 2011). Cetaceans like bottlenose dolphins and sperm whales, have no fur which can be oiled and since they have blubber to help them prevent internal heat loss, they do no need fur for that purpose (NOAA, 2010); this means that cetaceans can not develop hypothermia like seals and sea otters can when in contact with oil. Still, oil could harm then in many ways. For example, when dolphins surfaced to take a breath of air, the oily waters can get into their blowholes before entering their lungs which can then, make breathing very difficult for them (New England Aquarium, 2010). To make matters worse, oil has been known to cause vision damage, since the oil can get into eyes of cetaceans. Oil can make it harder for whales and dolphins to catch and digest their food. For the large baleen whales, like the Bryde’s whale, oil can harm the baleen they depend on for filter feeding, thereby, deceasing their ability to feed, which could then, lead to starvation (NOAA, 2010). Overall, oil has been known to cause intestinal damage to cetaceans and even effect whale and dolphin health on a long term scale. As of January 2011, It has now been reported that bottlenose dolphins in the Gulf of Mexico may now be experiencing reproduction failure as a result of this spill. This is because researchers had been discovering the bodies of dead dolphin calves, many of which were stillborn, premature, or have died shortly after birth (National Geographic, 2011). The spill has seen at least nine live dolphin rescues that have occurred throughout the Gulf region (NOAA, 2011). However, of those rescues, only one dolphin, a juvenile male bottlenose dolphin named Louie, was successfully rehabilitated and was later transferred to the Dolphin Research Center in Grassy Key, FL in February 2011 (Segal, 2011). However, while the oil spill did have a lot of impact on most dolphin habitats throughout the Gulf Coast, one population of bottlenose dolphins in Orange Beach, Alabama was determined to have been not affect by the Gulf oil spill (NOAA, 2010). Currently, research is being done by NOAA (National Oceanic Atmospheric Administration) to determine the oil spill’s effect on a population of endangered sperm whales in the Gulf Coast for, many cetacean experts had pointed out in the past that the deaths of three whales would push this particular population into extinction, just like the effects of Alaska’s Exxon Valdez oil spill did with a resident killer whale population in the 1990’s and 2000’s (Than, 2010). After being rescued, oil-covered sea turtles were bathed using dish water soap to remove the oil off their skin (photo by NEAQ). Sea turtles have inhabited the Gulf of Mexico for more about 100 million years. Five species of sea turtle, the green, Kemp’s Ridley, loggerhead, hawks-bill and leatherback sea turtles can all be found in Gulf coast waters and they were all put at a great risk by the BP oil spill (National Wildlife Federation, 2011). Many sea turtles nest on Gulf Coast beaches that range from Mexico, to Florida. Because oil can damage turtle nests, wildlife volunteers in Alabama developed new ways to monitor turtle nests in beaches where the oil did not hit. The new methods included cleaning up any oil tar that may have washed up these beaches while conducting nighttime surveys along side clean-up crews; this criteria would start at nighttime, for, this was the time between April and October when female sea turtles came to these Alabama beaches to lay their eggs (Alabama Sea Turtles.com). However, the hatching season began to approach, there was a lot of public concern about newly hatched turtles entering the oil covered waters of the Gulf. If the hatch lings were to emerge on oiled-covered beaches, they can suffer from surface exposure, due to short-term exposure to oil tar that would cover the beaches where they hatched as they make it to the water (National Wildlife Federation, 2011). Just to make matters worse, when these turtle hatchlings do make it into water, it would be no safe haven either. Out in the ocean, young turtles rely on seaweed to serve as a shelter that both protect them from predators, and simply, to rest. However, when the seaweed that the young animals rely on as a main habitat got covered in oil, the hatchlings were to doomed to their deaths, because once seaweed is covered in oil, it suffocates and becomes deprived of sunlight. Therefore, the hatchlings, had no protection what so ever. So, in response to public concern about the oil affecting turtle hatchlings and nests, biologists throughout the country began to relocate more than 275 sea turtles nests from the Gulf coast to beaches near the Kennedy Space Center in hopes to prevent a high hatchling mortality rate (Lelis, 2010). By the end of the 2010 summer season, sea turtle biologists estimated about over 15,000 sea turtle hatchlings made it to safe waters of Florida’s Atlantic coast (National Geographic, 2011). Meanwhile, oil can also cause turtles to become both sick and injured. For example, turtles can develop fatal respiratory problems, like pneumonia and cause breathing difficulties when the animals breathe the deadly vapors (New England Aquarium, 2011). When the turtles were first rescued, they were mainly covered in oil, which can also, cause their skin to come off as a result of burning. So, to de-oil the animals, rescuers used dish washing soap to clean the oil off the animal and the process lasted for up to hour. In fact, NOAA statistics show us that about 575 sea turtles were rescued and rehabilitated by biologists and zoo professionals throughout the Gulf coast while 397 of these animals were released by into the wild (NOAA, 2011). Not only did birds become sick and injured from being covered in oil, their habitats were affected by this disaster as well. Of all the animals that have been victimized by the 2010 Gulf coast oil spill, birds were the most common victims of this environmental disaster. About 8,183 of the animal victims of the Gulf oil spill were aquatic birds that rely on marshlands and beaches as critical nesting and feeding grounds (NOAA, 2011). The oil causes their feathers to both, mat and separate in which, it could cause them to lose both, buoyancy and the ability to regulate their body temperature. The birds need to keep their feathers peen, then, they would be able to keep themselves warm, keep parasites off their feathers, stay dry, and ensure that the feathers remain in good shape (National Wildlife Federation, 2011). As a result the oil-covered survivors are captured and taken into wildlife rehabilitation facilities where they would be rehabilitated. The rescue efforts were very successful that, In total, about 1,246 sea birds were successfully released back into the wild throughout Louisiana, Mississippi, Alabama, and the Florida Panhandle (International Bird Rescue). Yet, despite the successful rescue efforts, the oil spill did a large amount of damage to hundreds of seabird nesting grounds throughout the Louisiana coastline. Once the oil hit those nesting grounds, not only were the nests now contaminated with oil, the eggs got covered in the oil as well. This meant that when the birds were trying to escape the incoming oil, they were also deserting their nests and leave their now too soft, and too thin eggs behind (New England Aquarium, 2010). Experts who have studied bird colonies in Raccoon Island, Louisiana had admitted to not planning to rescue the nesting birds because they feared that they could have disrupted entire colonies like causing adults to kill their chicks and abandoning their nests (Brown, 2010). In the spring of 2011, bird experts from the National Audubon Society reported that some nesting colonies of endangered brown pelicans returned to their oil-inflicted nests; yet, they have insisted that it could be many years before the extend damage of their food supply is known (National Geographic, 2011). The most tragic sight that beach goers have been seeing lately is the sight of small shorebirds that are now feeding on oil tar along with their prey while at the same time, get their tiny feet and feathers covered with oil and bringing the tar back to their at-risk nests. While the total impact of the Gulf oil spill may not be known for many years, the effect that it had on wildlife in the past year is shocking. In the past year since the oil spill first happened, dolphins faced a huge unusual mortality rate, sea turtle eggs put at risk of never hatching because of the oil covered the nests while researchers worked to relocate the surviving nests to the Atlantic coast, and birds, victims of being oil-covered now have to live with nesting in contaminated nesting grounds and suffer a high chick mortality rate. It’s safe to conclude that the oil spill is right now having and having a lot of negative effects on animals native the Gulf coast. For example, most species of dolphins are not endangered, but counting all the dolphin deaths that have occurred since the oil spill is troubling because once a dolphin dies, it’s body sinks to the bottom of the sea; so, it’s hard to get a full count of how many more dolphins died than what the NOAA statistics report (Animal Planet, 2011). So while full surveys on post-oil spill animal moralities will take twenty years or so to complete, it’s safe to say that oil spills can be prevented. First, It has been recommended that oil engineers should always check for any leaks that might be suspicious while being cautious at the same time when both fueling and de-fueling because oil spills often happen because of employee carelessness (ask.com, 2010). As for if a person comes across a stranded animal, alive or dead, NOAA recommends for everyone to call their stranding hotline to report a sick, distressed, orphaned, dead, or injured animal. That way, the networks can respond to this stranding quickly and determine how and why the animals strand. That way, everyone would be doing their part in preventing oil spills and keeping the oceans oil free. Overall, the number one thing to do to ensure that no oil spill would ever happen is educating the public. Through education weather if it’s at a marine life facility, or on a eco-tour boat, educating the public about the effects that oil spills can have on animals is on thing that would ensure both a change in attitude towards wildlife and develop a new awareness about how oil spills can affect wildlife and the habitats they depend on. Only education and a change in attitude towards the Gulf Coast along with long term research will eventually preserve the wildlife of the Gulf of Mexico. Each year, around 50 to 200 sea turtles will beach themselves on the shores of the Massachusetts coastline from late October through December as a result of cold stunning. For those who may not be familiar with this term, “cold stunning” is when a sea turtle is exposed to cold water temperatures that are less than 65 degrees followed by a sudden hypothermic reaction. The symptoms include decrease in heart rate, a decrease in circulation, lethargy, shock, dehydration, pneumonia, and even death. But the question that many people have in mind is why do these turtles come to Massachusetts waters in the first place? Well, this is because every summer when the water temperature gets to be about 70 degrees, the sea turtles (many of which are Kemp’s Ridleys) will feed on crabs in Cape Cod Bay after swimming through the Gulf Stream Current. The waters of Cape Cod Bay serve as a rich and hospitable seasonal habitat for the migrating animals who could often be seen in bays, inlets, and sheltering harbors. However, by late-October, the turtles will begin to migrate south to the warm waters of Florida, and the Caribbean while those who get trapped in the arm of the Cape, especially those feeding in shallow and inlet waters, will eventually become victims of cold stunning and before being pulled by the wind to the beaches of Cape Cod. Once these turtles strand on the beach thanks to the unforgiving winds, they are now at the mercy of the icy cold waves and tides. There, the clock begins to tick when it comes to matter of life and death. This is where organizations like the Massachusetts Audubon Sanctuary of Wellfleet Bay and the New England Aquarium come in. During the cold stunning season, volunteers will patrol the beaches after high tide in search of sea turtles in need of rescuing from the icy cold waters. Once a turtle is found, sometimes, volunteers will gently touch it to check for a reaction to see if it’s either a live or dead and sometimes, it’s hard to determine that because some animals could be found, show no reaction, be presumed dead before finally showing a reaction. Turtle experts call this “Lazarus turtles” because of this coma-like reaction that some of the turtles present. Meanwhile, once the turtles are rescued, they are transported to Massachusetts Audubon’s Wellfleet Bay Sanctuary where they are held for a short period of time before being transported to the New England Aquarium’s Marine Animal Rescue Facility in Quincy where they could receive treatment for up to two years depending on their condition on a long-term basis. Sometimes, some of these turtle patients will be transferred to other facilities like SeaWorld, or the National Aquarium in Baltimore where they will continue their rehabilitation before being released in the spring and early summer months in the waters off Florida’s Atlantic coast. After nearly six to eight months of rehabilitation, the remaining sea turtles (the ones who were never transported to other facilities) are released into either the Atlantic Coasts of Florida, Virginia, and southern Cape Cod where some of the animals are satellite tagged so that biologists can continue to keep track on the progress of the released animals in all hopes they do get themselves stuck in Cape Cod Bay again and return to their tropical habitats. 1. Do not put it back in the water. Do not remove it from the beach. Move it above the high tide line. 2. Cover it with seaweed and mark its location with a stick, buoy or other beach debris. 3. Call the Massachusetts Wellfleet Audubon Society at 508-349-2615 or the New England Aquarium’s rescue hotline at 617-973-5247and leave a message as to its location. Please be as specific as possible in giving directions from the nearest beach access so rescuers and volunteers can recover the turtle quickly. Surgical Suite where Toba, a rescued green sea turtle had his bandage change today. So today, while I was finishing up my first shift for the day, I got to briefly witness a green sea turtle named Toba get transferred from one of the sea turtle ICUs, to the newly renovated surgical suite. The reason why Toba was brought to the suite was because he just needed another bandage change an injury he suffered back in November. Although I was not allowed to take any photos of the procedure, I did get to see a little bit of little Toba go through just another step towards recovery. If all continues to go well, Toba will probably be released back into the wild. 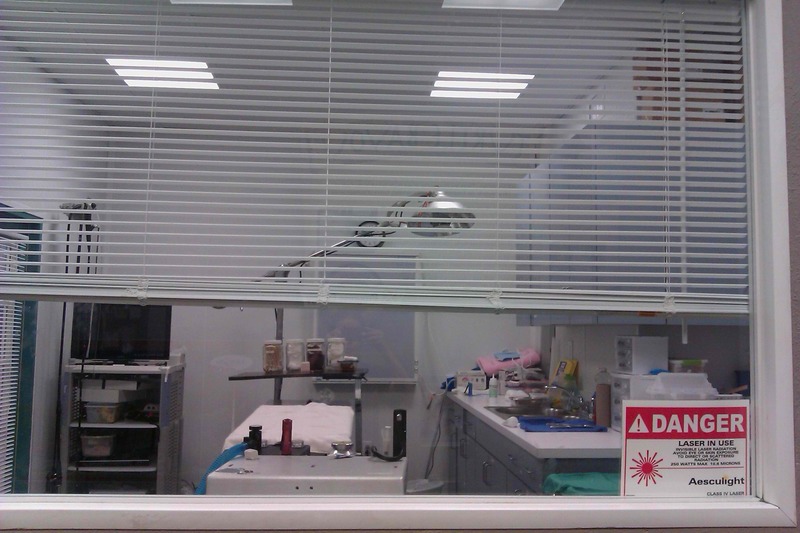 The surgical suite was where a scene from Dolphin Tale was filed. In a scene from the upcoming movie, a veterinarian named Dr. Clay Haskett (Harry Connick Jr.) performs an operation on a stranded sea turtle. 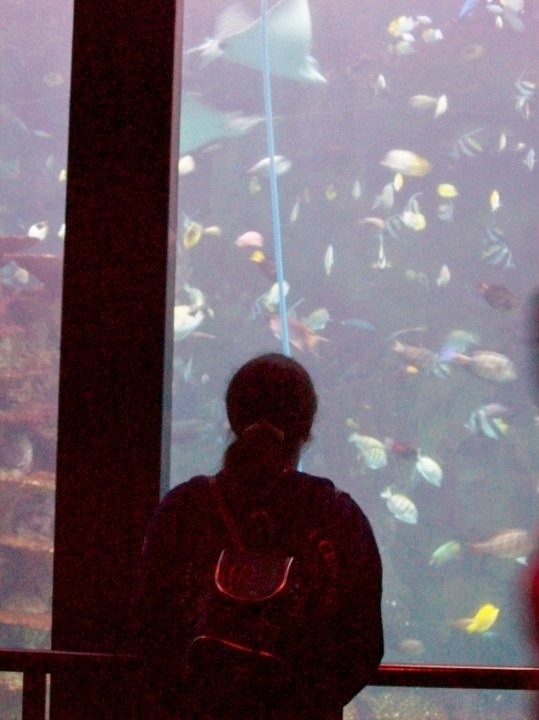 Once when the movie was finished, this suite was donated to the aquarium for future operations on sick and injured animals that would eventually have to undergo surgery in an attempt to save their lives. Today was my day off and I had just received an email from Anne this morning that the rescue team had to perform surgery on a Kemp’s Ridley sea turtle named Rebel to remove a broken flipper that was unable to be saved. Based from X-ray exams, the staff learned that several bone fractures of Rebel’s were completely damaged. This made his left flipper completely dislocated as a result of an injury from a boat strike. As a result, the turtle rehabilitation team made a decision to perform surgery on him in order to save his life. However, it was only after an observation of the injury and a long discussion between three aquarium veterinarians, the decision was made to fully amputated the infected flipper due to the nature of the unhealthy look of the bones within the animal’s flipper. After a two-hour surgery, and an hour wake up, Rebel the sea turtle ended up becoming a “three-flippered turtle”. During this surgery, the entire front flipper was completely removed, almost up to the shoulder joint. From what I am hearing from Anne, Rebel was docked in a dry area overnight and was returned to the water by the turtle rehab team this morning. But, they will still have to continue monitoring how he’s doing on a long term basis just to make sure that he is making a full recovery.